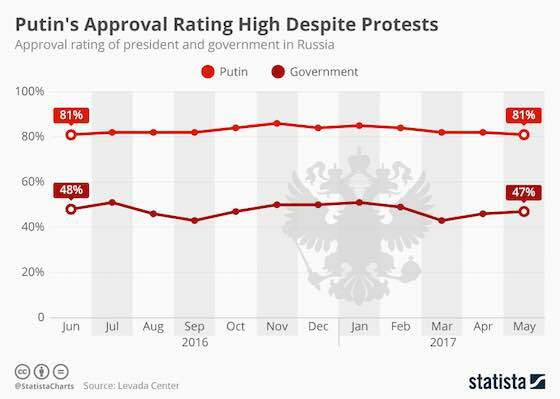 This chart shows the approval ratings of the president and government in Russia. In contrast to the embattled President Trump, President Putin has been enjoying very high approval for a number of years. In fact, according to Levada Center, his rating has not fallen below 80 percent since March 2014. This is made even more impressive when looking at public opinion on government in general. Although he holds the most senior position in the Kremlin, Putin currently exceeds the government's rating by 34 percentage points. Despite this seemingly unshakeable position, thousands of people have taken to the streets of Moscow and other Russian cities today in anti-corruption rallies which have so far led to hundreds of arrests. Opposition leader and organizer of the protests, Alexei Navalny, was also detained at his home this morning. Mr Navalny plans to stand for the presidency next year but authorities say that, due a previous embezzlement conviction, he is unable to do so. Europe: "Putin's Approval Rating High Despite Protests"